HOW CAN AWINGU HELP HEALTHCARE PROVIDERS BECOME HIPAA COMPLIANT? Keeping personal and organizational data private is essential in any organization. But even more so when this data concerns highly personal and important data like healthcare records. The HIPAA Privacy regulations require health care providers and organizations, as well as their business associates, to develop and follow procedures that ensure the confidentiality and security of protected health information (PHI) when it is transferred, received, handled, or shared. This applies to all forms of PHI, including paper, oral, and electronic, etc. Furthermore, only the minimum health information necessary to conduct business is to be used or shared. CAN AWINGU HELP HEALTHCARE PROVIDERS BECOME HIPAA COMPLIANT? We often get the question if Awingu ‘is HIPAA compliant’. The Awingu software as such is not HIPAA compliant, nor can it be. However, it can help healthcare (service) providers become or facilitate HIPAA compliance. We made an overview of the standard specifications required and added the points where Awingu can step in. This way you can have a clear perspective how Awingu can facilitate you in becoming HIPAA compliant. 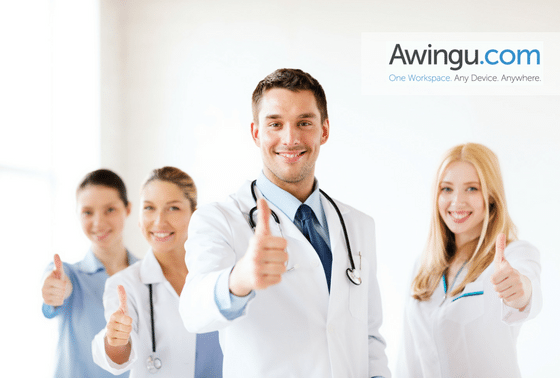 You can download here our whitepaper “How can Awingu help healthcare providers become HIPAA compliant?” and find out all the information necessary! In case of any further questions, feel free to reach out to us!